Japan has long been the standard for obscure and weird collectibles and their style has influenced artists all over the world. Japanese culture is expressive and fun and steeped in tradition that can sometimes look odd to other cultures that know nothing of the country’s rich history. Things that may look to be in bad taste in North America may seem common place in Japan. 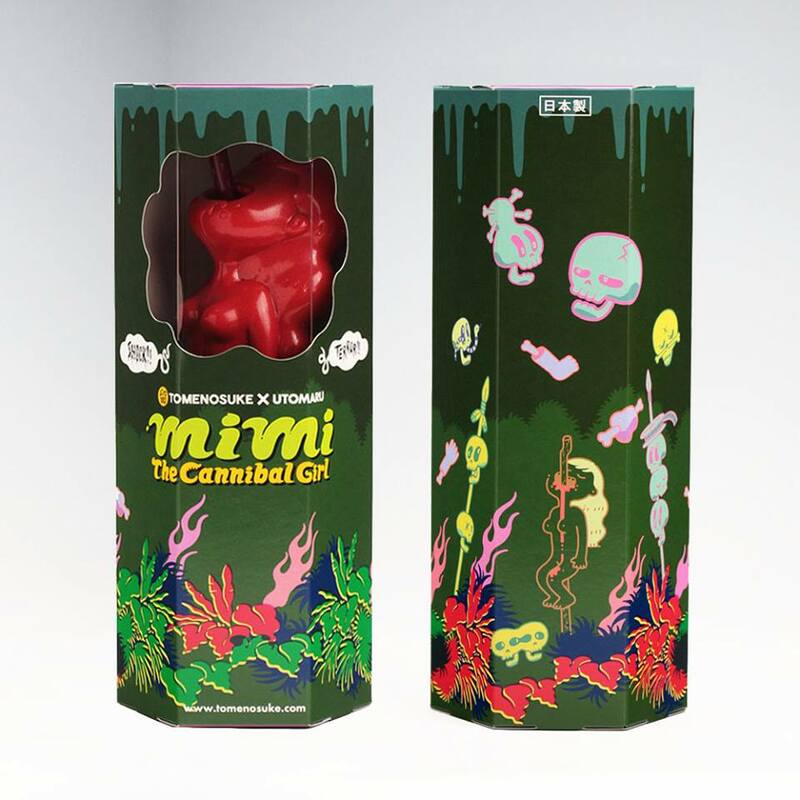 Case in point, MIMI THE CANNIBAL GIRL by artist Utomaru. This may look like a familiar figure to some horror fans that like to watch cannibal flicks, but Utomaru has done the unbelievable and made a girl impaled on a wooden spike a highly collectible piece. Tomenosuke an art collectible gallery-shop located in Japan sells some of the finest obscure designer toys available today. The gallery sells its own collectible toys and collaboration pieces they’ve produced many up and coming artists. A few of Tomenosuke’s more obscure pieces include FLESH GORDON PISTOL by artist Gregory Jen. 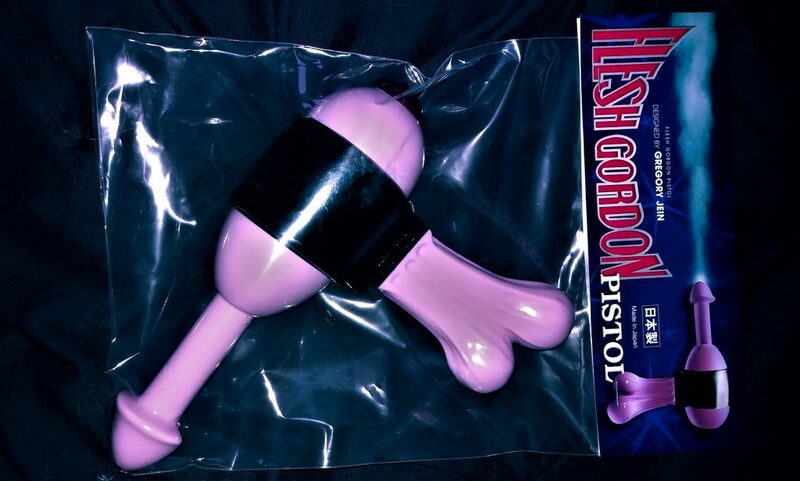 This “pistol” is based on the 1974 science-fiction comedy spoof Flesh Gordon. 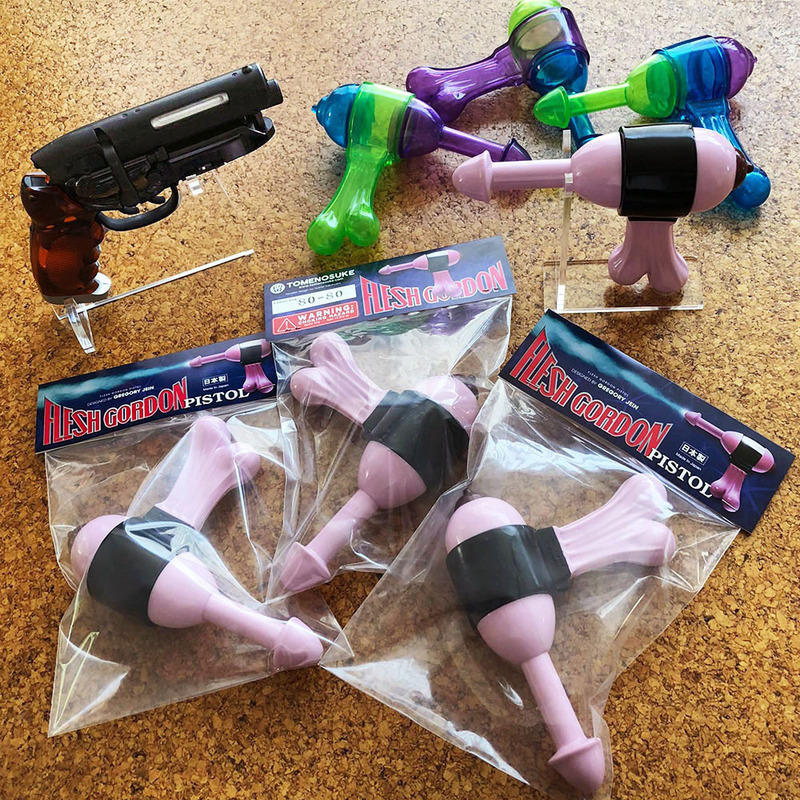 The 1/1 scale sofubi (soft vinyl) toy incorporates many parts from male and female anatomy that come together to form a “pistol”. Tomenosuke offers this gun in original (￥9,980), Translucent Green, Blue and Purple (all at ¥6,980 each). 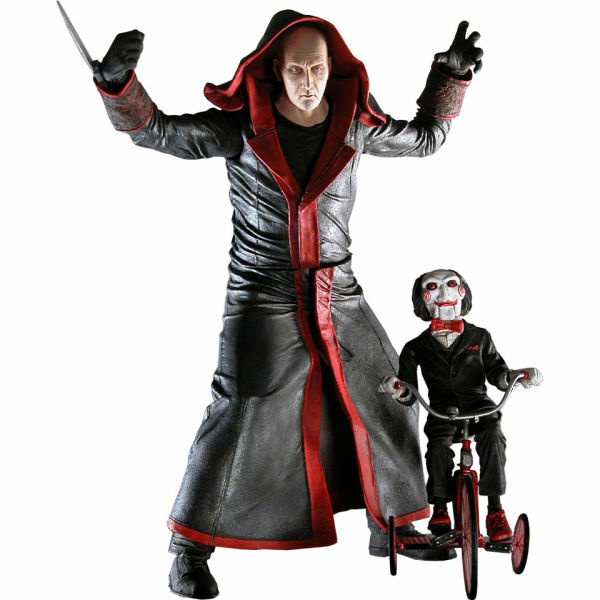 Unquestionably one of the more odd things that have been available as a movie collectible, of course, these are meant for adult collectors (each edition is available in limited stock). The Flesh Gordon sexploitation film itself has some notably good special effects by several then-unknown people, including Mike Minor, Greg Jein and Rick Baker. The film also incorporates some exciting stop motion in the vein of Ray Harryhausen (the special effects crew named the towering stop motion creature “Nesuahyrrah”, which is Harryhausen backwards). The film was popular enough to get a sequel and even a four-issue comic book miniseries that was released in 1992. The comic was written by Daniel Wilson and published by Aircel Comics. 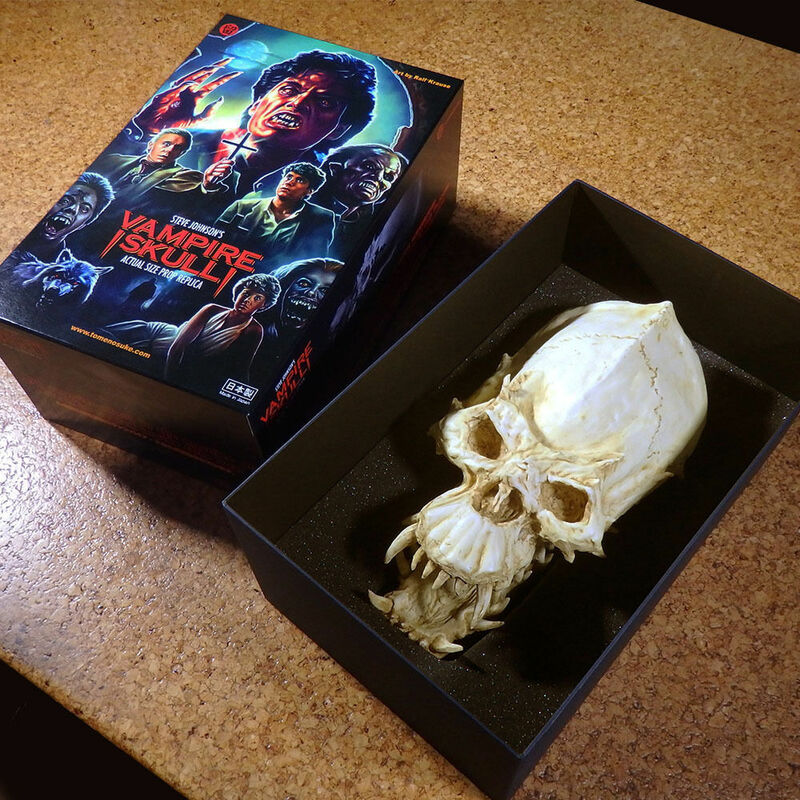 Next up is STEVE JOHNSON’S VAMPIRE SKULL PROP FROM THE FILM FRIGHT NIGHT. This prop replica is probably not the first thing that pops into one’s mind when thinking of the 1985 horror classic directed by Tom Holland, but the final showdown is unforgettable to say the least. 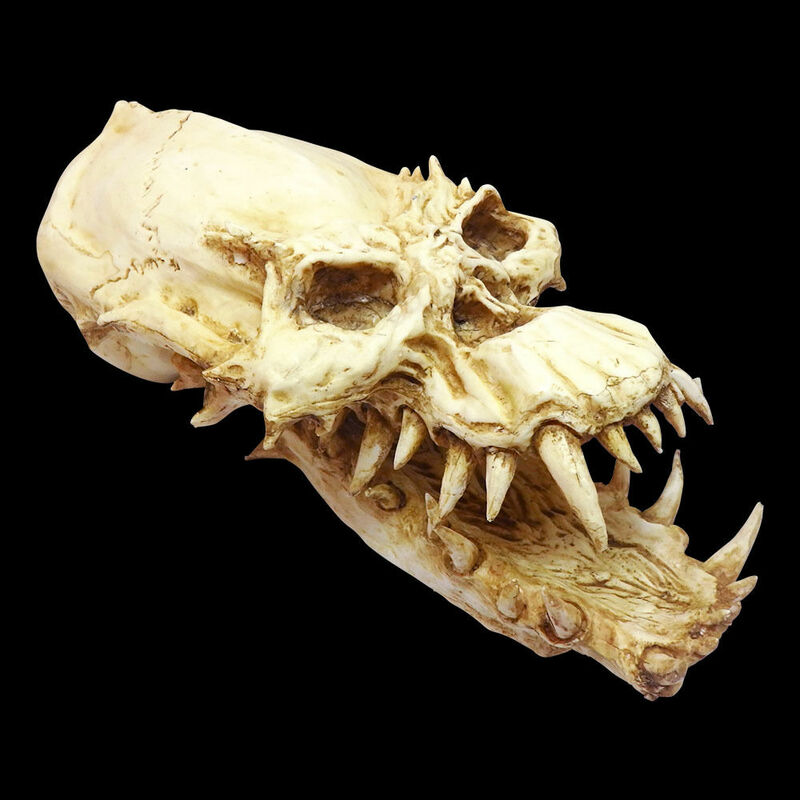 The prop replica with only 30 available, is 11.8 inches in length, 6 inches wide and 4.7 inches in height, this whopping horror piece is going to need a full display shelve to itself (be careful though as the piece also weighs almost 5 pounds). Here’s a little known fact about the Vampire prop used in Fright Night: the original vampire puppet was actually created to be used in Ghostbusters (1984) to represent the transformation of Eleanor Twitty (the ghost reading books in the library), but it was considered too frightening for that film. The unfinished piece was then utilized for Fright Night, which the special effects crew had moved work on. 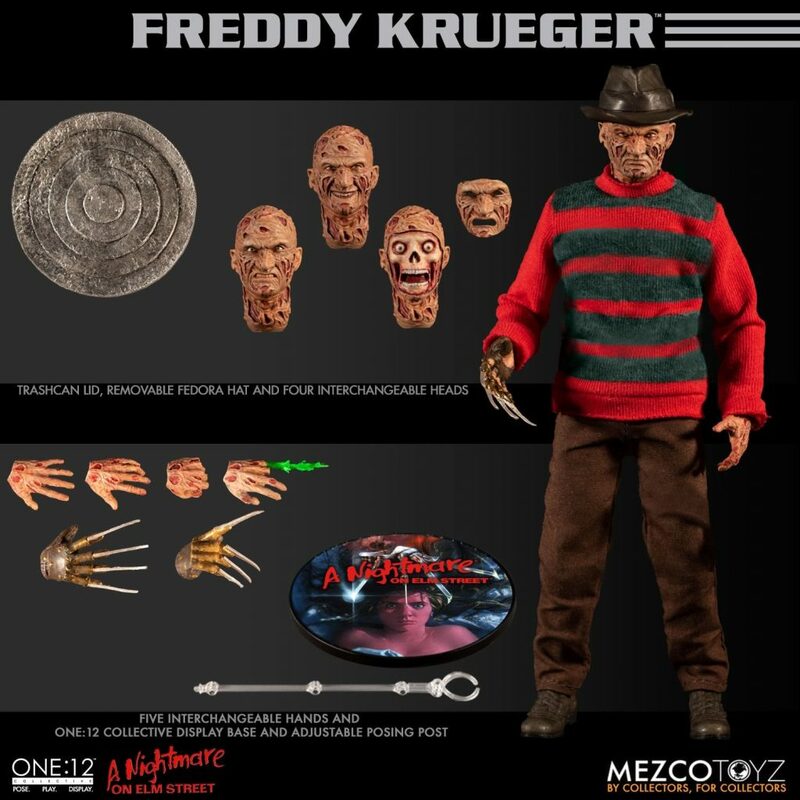 With a price of ¥64,800, this collectible is for a true fan of Fright Night. 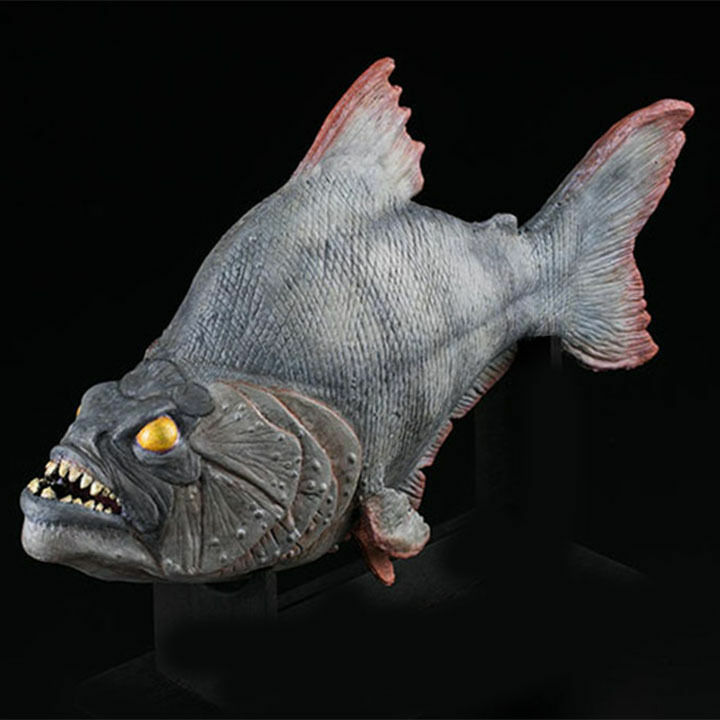 Finally, here is the fully licensed PIRANHA PROP REPLICAS MODEL by which was originally created by Rob Bottin for Piranha (1978). Joe Dante’s classic, of course, is about flesh-eating piranhas that are “accidentally” released into summer resort’s rivers. It “spawned” a sequel that was directed by James Cameron and also a couple films of “3D” versions in the 2000’s. 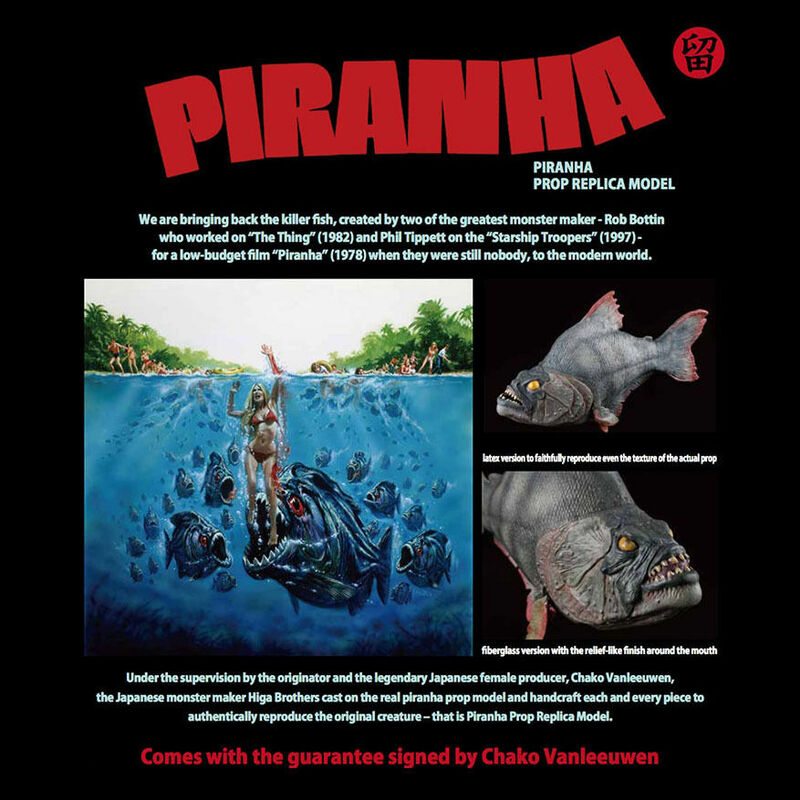 Created under the supervision of legendary Japanese female producer, Chako Vanleeuwen, the Japanese monster-makers Higa Brothers made a cast of the real piranha prop model and then handcraft each and every piece to be as precise and authentic as the original.This replica collectible is available in three very different versions piranha prop replica model resin cast kit (unpainted) (￥25,500), Piranha prop replica model (Fiberglass version – with full paint job) with walnut display stand (¥53,440), and a Piranha prop replica model (Latex version full- with full paint job) with walnut display stand (¥69,800). 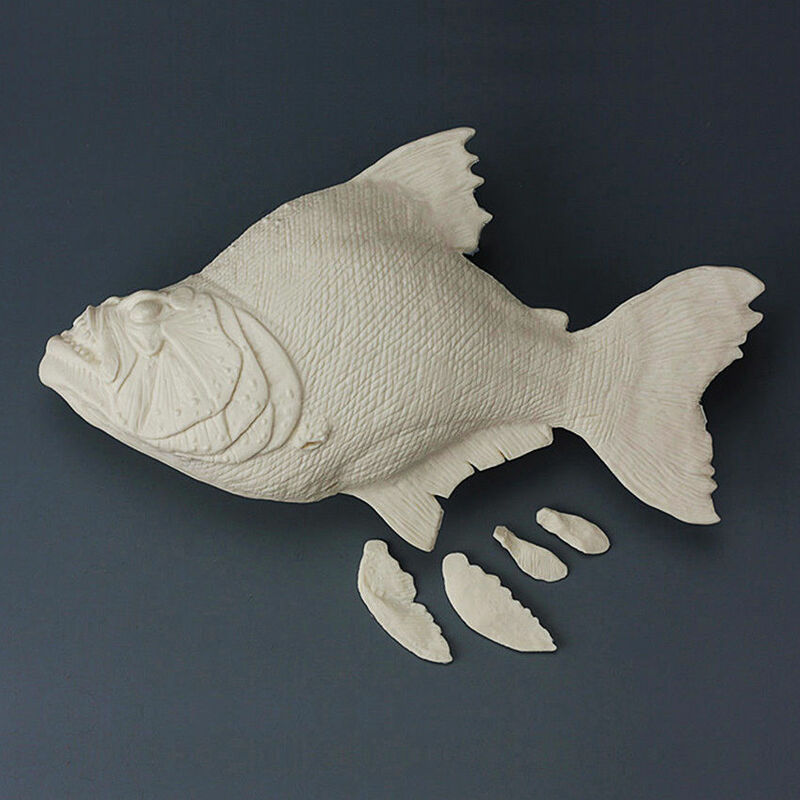 Each Killer fish has 12.5 inches in length x 8.0 inches in width, again any of these versions are going need a full shelve as they are long, wide and pretty heavy. Any of these great pieces would be a great “big” gift for that hard to buy for horror fan, just make sure to that the Japanese style is something they’re into. Check out these and more great oddities from Tomensuke on their website and social medias.